Untitled (15-04), 2015, Painted maple wood and aluminum, 25.5 x 15.5 x 1.75 inches. 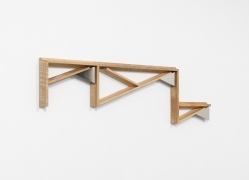 Untitled (14-07), 2014, Maple wood and nickel-plated aluminum, 46.5 x 12.75 x 1.75 inches. 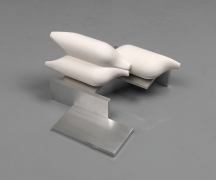 Untitled (92-09), 1992, Cast aluminum, 15 x 26.75 x 2.75 inches. 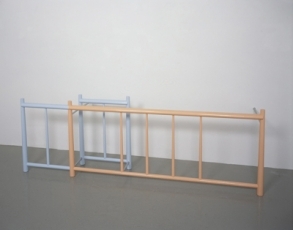 Untitled (11-02), 2011, Cast hydrocal and aluminum, 10.5 x 19 x 18.75 inches. Tendril (Thomaskirche), 2016, Cast bronze and painted wood, 36 x 16 x 4.25 inches. Glen Elder, 2017-18, Painted poplar, cast aluminum and welded aluminum, 25 feet x 120 inches x 48 inches (installation). 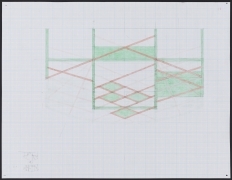 Study for Untitled (12-07), 2012, Colored pencil and graphite on paper, 38.75 x 24 inches, framed. Study for Untitled (13-06), 2013, Colored pencil and graphite on paper, 19 x 24 inches, framed. Richard Rezac (b. Nebraska, 1952) lives and works in Chicago. 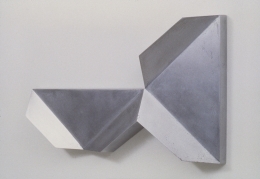 Since the mid-1980’s he has primarily made object-sculptures, essentially abstract in form. His sculpture is reliant on a deliberative process with each work, which allows for an on-going re-definition, however subtle. All of his sculpture has originated from drawing with the aim of synthesis and simplification. 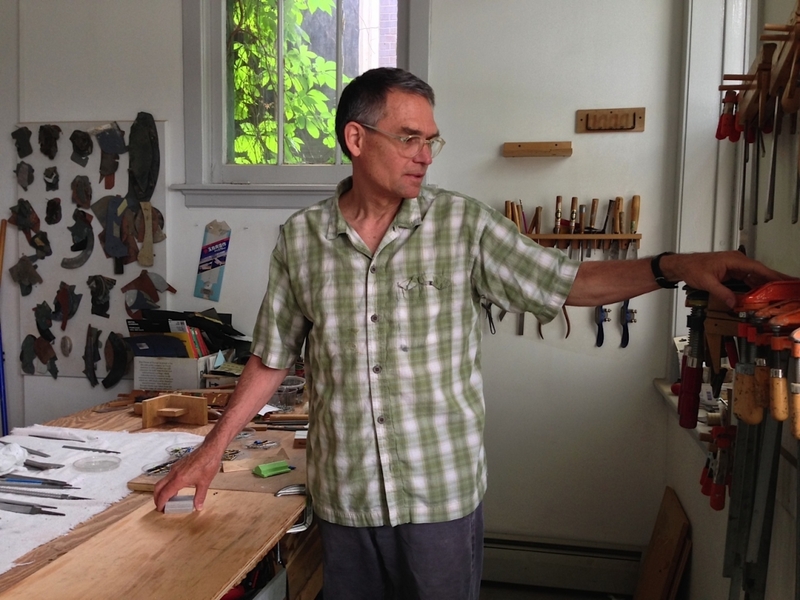 He has received the John Simon Guggenheim Fellowship, the Rome Prize Fellowship at the American Academy in Rome, the Joan Mitchell Foundation Award and the Louis Comfort Tiffany Award, among others. 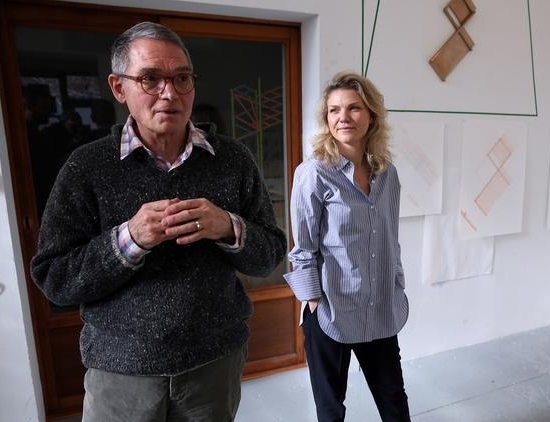 Since 2000, he has had 22 solo exhibitions, including at the Portland Art Museum, Oregon, Rhona Hoffman Gallery, The Renaissance Society at the University of Chicago, Galerie Isabella Bortolozzi, Berlin, Feature Inc., New York, Marc Foxx, Los Angeles and James Harris Gallery, Seattle. His sculpture is in the collections of The Art Institute of Chicago, Museum of Contemporary Art, Chicago, Dallas Museum of Art, Portland Art Museum, Detroit Institute of Art, Yale University Art Gallery, among others. He is Adjunct Full Professor at The School of the Art Institute of Chicago in both the Painting and Sculpture Departments.